San Diego's Turkish community paused Tuesday night to remember the victims of the recent terror attacks in Turkey. 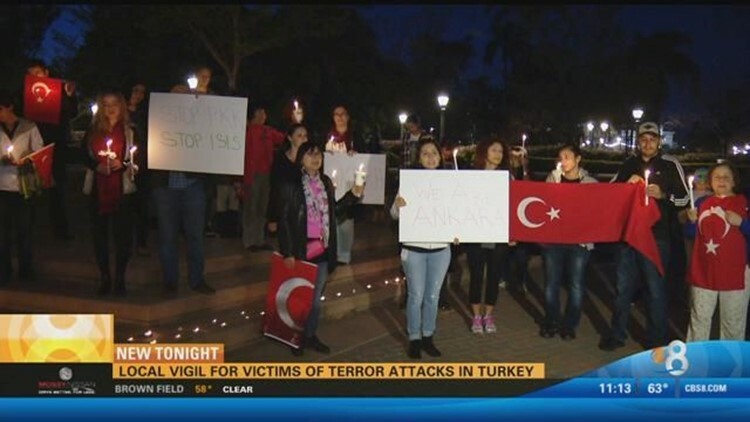 ANKARA, Turkey (CBS News 8/ AP) — San Diego's Turkish community paused Tuesday night to remember the victims of the recent terror attacks in Turkey. A candlelight vigil was held in Balboa Park after dozens were killed in a car bombing on Sunday. Burhan Ozbilici in Ankara contributed to this report.